It can be hard sometimes being a Santa Monican, because your friends on the East Side and downtown constantly remind you that their neighborhoods are so much more creative and happening. Except that Santa Monica has GLOW. That’s the nighttime, free, festival of artworks of illumination spread along the beach by the Santa Monica Pier; it was first launched in 2008 by co-creators Marc Pally and Jessica Cusick, Santa Monica’s Cultural Affairs manager; it is a delight for all ages and it returns this Saturday, September 28, from 7pm to 3am, with 15 artists from around the globe showcasing what will likely be a stunning array of original works, lighting up the night like giant fireflies. Featured artists include Aphidoidea, Jonathan Markowitz Bijur, Mathieu Briand, Marni Gittleman, Steven Hull, Glenn Kaino, Shana Koenig, Rebeca Mendez, Patrick Scott, Victoria Vesna, Karen Atkinson, Djoko Walujo, Susie Allen, Marvin Tunney and Janet Echelman, who recently appeared on KCRW’s Guest DJ Project. Works you’ll find there, as shown in renderings: a suspended thread-like sculpture by Janet Echelman (above); Rebeca Mendez’s Circumsolar Migration1, left, and Victoria Vesna’s reworking of the Ferris Wheel (itself a spectacular light show), with light and performance, on the Santa Monica Pier, below right. KCRW is part of the program this year, and has created Glow Soundscape, an audio tour hosted by KCRW’s DJs with the voices of each artist talking about their creations, navigation notes and music for the journey. Download it in advance and let KCRW guide your experience during one of the largest public art events in the world! In addition, LA-based artist Steve Boyer has created an experience with color, light and sound “via the device that often separates us – our cell phones” called Colorfields. While it will be ongoing throughout the evening, he is encouraging attendees to gather at 10pm to put his technologically-driven display to the test. Participants will need to download a special smartphone app, which is available now for both iPhone and Android devices. As visitors move from location to location within the Colorfield zone, the app synchronizes locational information via GPS and the colors and sounds on their cell phones will change. This participatory art experience will be centered at a location south of the pier on the beach in front of the Sea Castle apartments, between Loews and Shutters hotels. Find out more at KCRW.com/Glow. 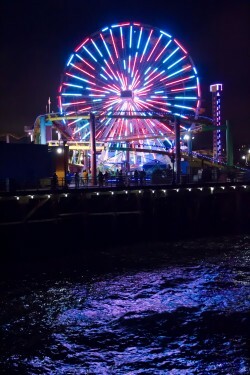 The biggest challenge Saturday night will be parking as GLOW attracts thousands of people, so the City of Santa Monica is encouraging, begging, you to cycle if possible, and will provide plenty of bicycle valet parking. For more info, click here. If possible, make your journey easier and more pleasant by coming earlier in the day, and take some time to go visit Santa Monica’s new Tongva Park. 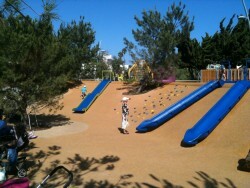 Designed by James Corner Field Operations, a prolific landscape designer who is best-known for his work on Manhattan’s High Line, Tongva Park (its name the result of lobbying from a group that wanted to honor the area’s purported first settlers) has become an instant pride of Santa Monica. It links Ocean Avenue to 2nd Street and Santa Monica’s City Hall, a fine example of “WPA Moderne” architecture (1938-39, by architects Donald B. Parkinson and Joseph M. Estep), that had been long off the beaten track but now regains a civic presence. City Hall is fronted by a smaller park, also designed by Corner, called Ken Genser Square. Tongva Park is as much a structure as it is landscape, since Corner took a more or less flat square of land and has transformed it into rising and falling pathways, slopes, bridges and viewing pods. The park gives over a lot of space to circulation, with sinewy gravel walks and concrete benching that encourage walking and sitting while connecting tourists and locals to 2nd Street and City Hall via a winding diagonal path. But there is also plenty of shady and lush planting: large sycamore, olive, pine, ficus and strawberry trees, and gorgeous succulents and natives, nurtured, says the eco-conscious city, “with SMURRF water (retained on-site in bioswales).” And then there is space to play. 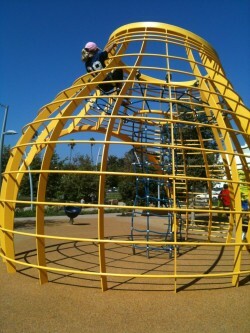 A section for children pops with vividly colored play equipment, a climbing wall and fountains to cool off. 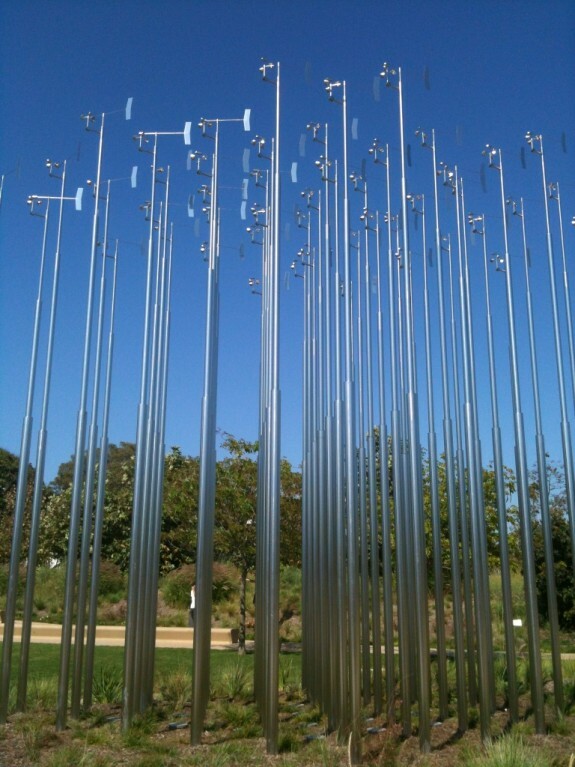 Another feature of the park is its public artwork, “Weather Field No. 1,” by artist Iñigo Manglano-Ovalle, right, which consists of 49 telescoping stainless steel poles, topped with anemometers and wind vanes, and staggered in height in increments of one foot. 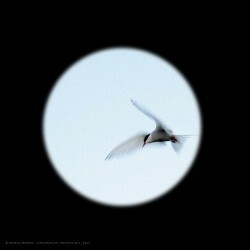 Viewable from many vantage points in the park, it glitters and flutters in the sun and the wind. If GLOW and Tongva Park and its artwork exudes commitment to civic space and public art, another, older artwork, located right near the new park, between City Hall and the Civic Center, is getting no such TLC. Paul Conrad‘s “Chain Reaction”, below, a scream by the late cartoonist against the insanity of nuclear war that was installed in 1991, now sits behind a fence, deemed dangerous and irreparable by the City of Santa Monica. Whether or not one finds the artwork beautiful per se, it is bracing and direct and it also evokes a connection to a time when Santa Monica was unashamedly progressive and less commercial; before it became the comfortable city dealing with the challenges — and, of course, benefits, including Tongva Park and GLOW — of affluence. Christopher Knight has made a compelling case for its preservation (picture, left, by Luis Sinco, for the LA Times), adding critical fuel to a campaign already underway, and KCRW’s Lisa Napoli reported on the mystery benefactor who made the sculpture possible: Joan Kroc, widow of the founder of the McDonalds empire. Community fundraising has raised around $30,000 of the estimated $400,000 reconstruction costs (a number questioned by Knight), which the City Council has agreed to match dollar for dollar up to a maximum of $50,000. Supporters have until this coming February to secure the necessary funds. For more information about the campaign, click here. 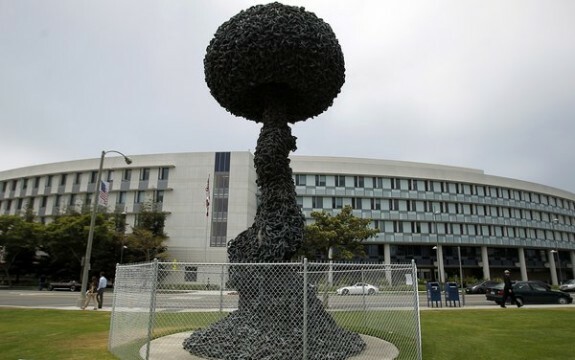 Coincidentally, Tongva Park’s artist, Iñigo Manglano-Ovalle has also tackled nuclear war, it appears, in an art piece he created named Dirty Bomb.